Abidjan, Cote d’Ivoire, 6 September 2017 – Two women, working at both ends of the agriculture supply chain in Africa, have each been awarded the 2017 Africa Food Prize. Hon. 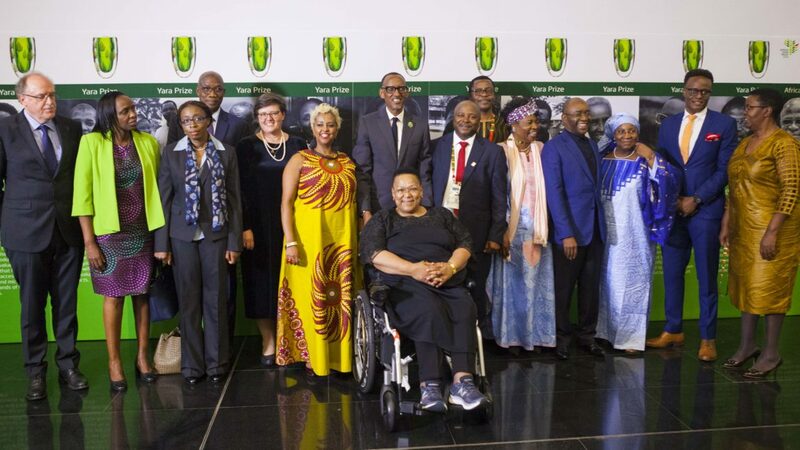 Prof. Ruth Oniang’o, a professor and advocate of nutrition from Kenya, and Mme Maïmouna Sidibe Coulibaly an entrepreneur and agro industrialist, from Mali were awarded for their exemplary efforts in driving Africa’s agriculture transformation. Hon. Prof Ruth Oniang’o is recognized as the leading voice of nutrition in Africa and for her relentless advocacy for the availability and affordability of diverse and nutritious crops for millions across the continent. She pioneered nutrition leadership in academia, research, and policy to improve food security and nutrition. Her groundbreaking work, with farmers’ groups and rural communities connects agriculture and nutrition both in research and practice providing a natural link between agriculture and nutrition. 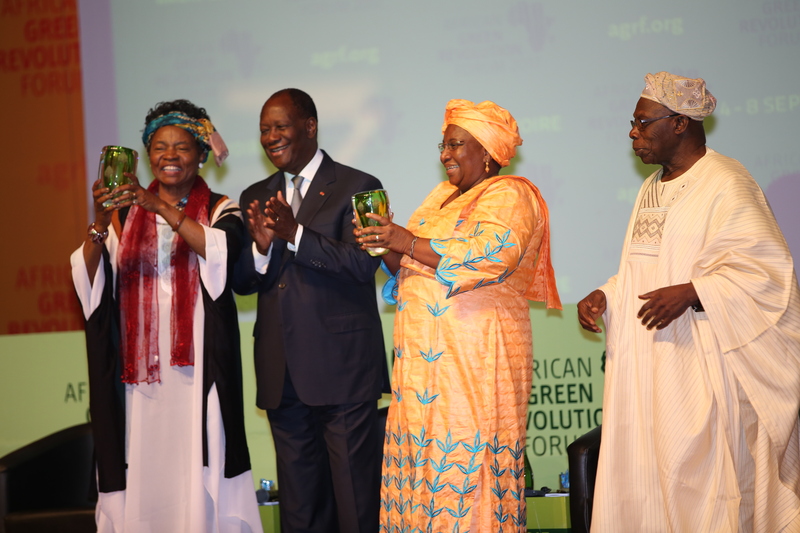 Mme Maïmouna Sidibe Coulibaly, on the other hand has been feted for her mission to produce and supply improved and high-yielding seed that have led to improved incomes and nutrition for millions in Mali and other West African countries. 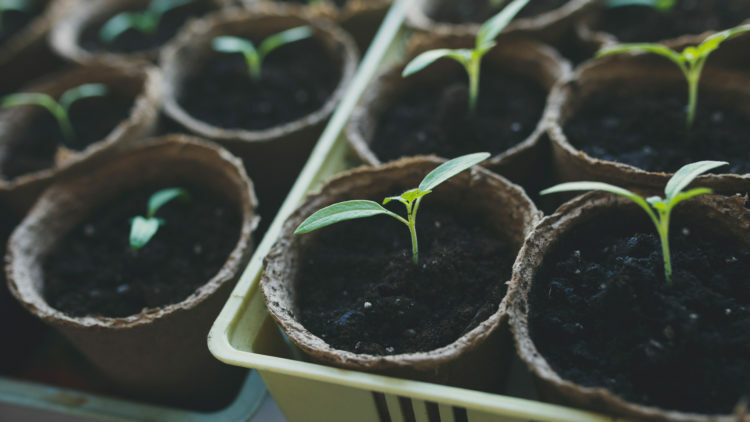 Through sheer hard work and consistency, she has overcome multiple hurdles to build a leading seed company that is fast becoming a model for Africa’s agri-businesses. Her company, Faso Kaba, specializes in the production and sale of a wide range of improved seeds, including cereals, oil seeds, market gardening, fodder and tuber seeds that can improve agricultural yields by up to 40 per cent. The Prize recognizes and puts a spotlight on shining examples of agricultural projects that are transforming lives and economies. The 2017 Prize winners come from both the public and private sector representing how both groups are working together to transform agriculture into a high value industry sector. The 2017 AFP awards had over 600 nominees establishing it as the most prestigious prize for African agricultural development. The Chairperson of the Prize Committee, H.E. President Olusegun Obasanjo of Nigeria, commended Hon. Prof Oniang’o and Mme Coulibaly on behalf of the Committee for their trailblazing efforts that are improving the socio-economic wellbeing of millions in Africa. “It gives me immense pride that this year’s winner are both women. This is a clear demonstration that women in Africa are at the forefront in terms of connecting the rising food needs and the continent’s vision for prosperity that is driven by agriculture and agri-business. The fact that the winners work at either end of the agriculture value chain, represent both private and public sector and are from different parts of Africa reflects the wide impact agriculture has in transforming economies and reducing poverty, way beyond the fields,” he said. As a member of Kenya’s Parliament (2003-2007), Hon. Prof Oniang’o dedicated her efforts to alleviating poverty and hunger, with special focus on science and technology, agricultural research and productivity, food security, nutrition, bio-safety legislation, use of fertilizer and other inputs, HIV/AIDS and gender issues. A strong believer in farming being the bridge between humankind and nature, Prof. Ruth Oniang’o spends most of her time with smallholder farmers and women in rural areas helping them to transform their household’s ability to produce, purchase and consume foods in higher quality and quantities. She reckons that smallholder farmers are the most valuable part of the market and the entrepreneurial value chain. “I believe we are what we eat. I realized early on in my life, when I dreamt of being a doctor, that food is the first medicine,” said Prof. Oniang’o as she received her Prize. 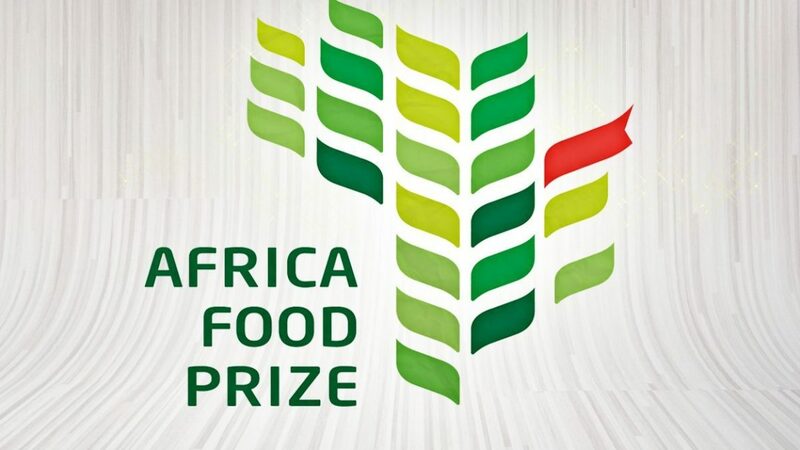 “I am humbled to receive this Prize and believe it highlights the work we have done and more importantly, it will contribute towards shaping our continent’s food future. I am a strong believer that Africa shall, one day, feed the world.” said Hon. Prof Oniang’o. For her part, Mme. 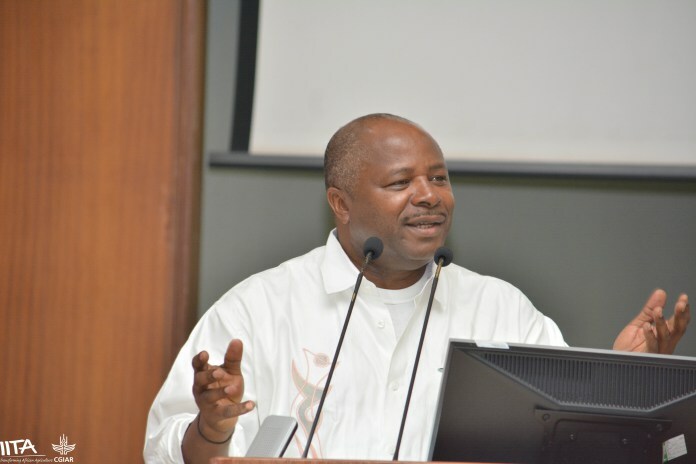 Coulibaly observed that the opportunities for Africa agribusinesses are endless. She however, decried the enormous challenges African entrepreneurs especially start-ups face as they try to set up businesses. “I am honored and humbled to receive this Prize. It is, in part, a validation of the hard work that I have put into building Faso Kaba with the support of my family and staff. I would like to say that it has been easy. There are many times when I almost gave up as I struggled to raise to finance the business. I am glad I stayed true to my vision, attended many trainings and worked with partners that believed in my vision,” ” she said. Today, we have become a model that many people that are starting businesses come to. I no longer book appointments with the banks. They call me with financing proposal. I look forward to a time when businesses will not struggle to start like I did,” she added. The 2016 winner of Africa Food Prize is Dr Kanayo Nwanze, the former President of the International Fund for Agriculture Development (IFAD). Dr. Nwanze was awarded for his visionary leadership and passionate advocacy to place African smallholder farmers at the centre of the global agricultural agenda, and for his demonstrated success in advancing policies, programs and resources that have improved the lives of millions across the continent.